A credit default swap (CDS) is a financial derivative or contract that allows an investor to "swap" or offset his or her credit risk with that of another investor. For example, if a lender is worried that a borrower is going to default on a loan, the lender could use a CDS to offset or swap that risk. To swap the risk of default, the lender buys a CDS from another investor who agrees to reimburse the lender in the case the borrower defaults. Most CDS will require an ongoing premiumpayment to maintain the contract, which is like an insurance policy. A credit default swap is designed to transfer the credit exposure of fixed income products between two or more parties. In a CDS, the buyer of the swap makes payments to the swap's seller until the maturity date of a contract. In return, the seller agrees that – in the event that the debt issuer (borrower) defaults or experiences another credit event – the seller will pay the buyer the security's value as well as all interest payments that would have been paid between that time and the security's maturity date. A credit default swap is also often referred to as a credit derivative contract. Bonds and other debt securities have risk that the borrower will not repay the debt or its interest. Because debt securities will often have lengthy terms to maturity, as much as 30 years, it is difficult for the investor to make reliable estimates about that risk over the entire life of the instrument. Credit default swaps have become an extremely popular way to manage this kind of risk. 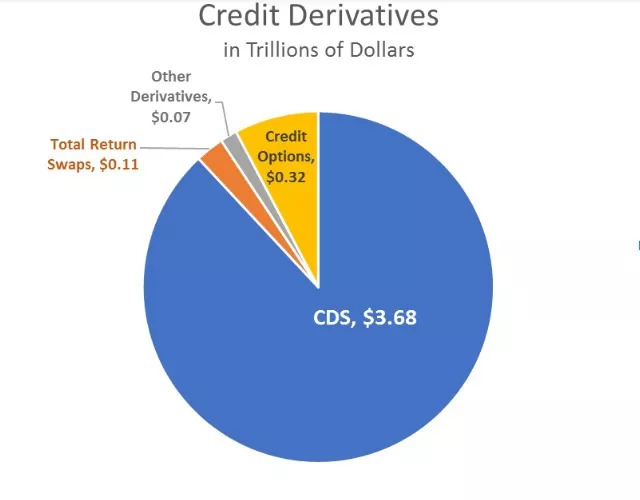 The U.S. Comptroller of the Currency issues a quarterly report on credit derivatives, and in a report issued in June 2018, it placed the size of the entire market at $4.2 trillion, of which CDS accounted for $3.68 trillion. A credit default swap is, in effect, insurance against non-payment. Through a CDS, the buyer can avoid the consequences of a borrower's default by shifting some or all that risk onto an insurance company or other CDS seller in exchange for a fee. In this way, the buyer of a credit default swap receives credit protection, while the seller of the swap guarantees the creditworthiness of the debt security. For example, the buyer of a credit default swap will be entitled to the par value of the contract by the seller of the swap, along with any unpaid interest, should the issuer default on payments. It is important to note that the credit risk isn't eliminated – it has been shifted to the CDS seller. The risk is that the CDS seller defaults at the same time the borrower defaults. This was one of the primary causes of the 2008 credit crisis: CDS sellers like Lehman Brothers, Bear Stearns and AIG defaulted on their CDS obligations. While credit risk hasn't been eliminated through a CDS, risk has been reduced. For example, if Lender A has made a loan to Borrower B with a mid-range credit rating, Lender A can increase the quality of the loan by buying a CDS from a seller with a better credit rating and financial backing than Borrower B. The risk hasn't gone away, but it has been reduced through the CDS. If the debt issuer does not default and if all goes well, the CDS buyer will end up losing money through the payments on the CDS, but the buyer stands to lose a much greater proportion of its investment if the issuer defaults and if it had not bought a CDS. As such, the more the holder of a security thinks its issuer is likely to default, the more desirable a CDS is and the more it will cost. Any situation involving a credit default swap will have a minimum of three parties. The first party involved is the institution that issued the debt security (borrower). The debt may be bonds or other kinds of securities and are essentially a loan that the debt issuer has received from the lender. If a company sells a bond with a $100 face value and a 10-year maturity to a buyer, the company is agreeing to pay back the $100 to the buyer at the end of the 10-year period as well as regular interest payments over the course of the bond's life. Yet, because the debt issuer cannot guarantee that it will be able repay the premium, the debt buyer has taken on risk. The debt buyer is the second party in this exchange and will also be the CDS buyer, if the parties decide to engage in a CDS contract. The third party, the CDS seller, is most often a large bank or insurance company that guarantees the underlying debt between the issuer and the buyer. This is very similar to an insurance policy on a home or car. CDS are complex because they are traded over-the-counter (meaning they are non-standardized). There is a lot of speculation in the CDS market, where investors can trade the obligations of the CDS if they believe they can make a profit. For example, assume there is a CDS that earns $10,000 quarterly payments to insure a $10 million bond. The company that originally sold the CDS believes that the credit quality of the borrower has improved so the CDS payments are high. The company could sell the rights to those payments and the obligations to another buyer and potentially make a profit. Alternatively, imagine an investor who believes that Company A is likely to default on its bonds. The investor can buy a CDS from a bank that will pay out the value of that debt if Company A defaults. A CDS can be purchased even if the buyer does not own the debt itself. This is a bit like a neighbor buying a CDS on another home in her neighborhood because she knows that the owner is out of work and may default on the mortgage. Though credit default swaps can insure the payments of a bond through maturity, they do not necessarily need to cover the entirety of the bond's life. For example, imagine an investor is two years into a 10-year security and thinks that the issuer is in credit trouble. The bond owner may choose to buy a credit default swap with a five-year term that would protect the investment until the seventh year, when the bondholder believes the risks will have faded. It is even possible for investors to effectively switch sides on a credit default swap to which they are already a party. For example, if a CDS seller believes that the borrower is likely to default, the CDS seller can buy its own CDS from another institution or sell the contract to another bank in order to offset the risks. The chain of ownership of a CDS can become very long and convoluted, which makes tracking the size of this market difficult. A credit default swap (CDS) is a financial derivative that is used by a lender to "swap" or offset the risk of a borrower defaulting on a bond or loan. The CDS buyer (lender or bondholder) pays a premium to the CDS seller during the life of the CDS like an insurance policy. CDS are traded over the counter and are non-standardized. Investors other than the original CDS seller and buyer can speculate on the value of a CDS, which make these instruments difficult to track before a financial crisis.